The reasons for immigration are different for different people. As far as choosing the country for immigration is concerned, it also depends on an immigrant’s choice and his attributes which make him eligible to move to some place. Today, Canada and Australia have emerged as the popular choices before immigrants due to which they need some guidance about where to go. The Canadian PR visa has more benefits to those who avail it as compared to the Australia PR. The most distinguishing part about the Canada PR visa is that the education and cost of living are lower in this country as compared to Australia. However, Canada also allows candidates to work in the USA on just a simple work permit. This is one of the most amazing features which draws so many candidates to Canada every year. Weather: As far as the climate is concerned, the weather in Canada is known to be a little bit extreme. The temperature in the winters is known to have touched -25 degrees Celsius which happens in the northern parts of this country. In such parts of the country, there are only two seasons comprising winter and summer. But in the more southern regions of the country, there are the 4 seasons, of Spring, Winter, Summer, and Autumn. In Australia, the temperatures are not known to be so extreme. The least temperature in Australia was found to be 8 degrees Celsius recorded in July which is definitely better than Canada. Due to the reason of weather, Australia is a better choice than Canada. Low cost of visa: As far as the cost of application for the PR visa is concerned, its much less for Canada than Australia. The fees for the Canada PR is Rs 28,675 equivalent to 550 CAD. Then there is also a secondary Right to PR fees which is levied for the candidate and is equivalent to 490 CAD. Both these fees of 550 and 490 CAD are to be paid by the candidate after he has got the most wanted ITA. So, this is equal to Rs 50,000 and then there are the fees for IELTS(Rs 11,300) and ECA(322 CAD equivalent to Rs 16,787). Hence the total fees are approximately Rs 80,000. The total fees for the Australia PR fees are 3,670 AUD which is as much as 1,86,648 INR. Apart from that, the cost of IELTS is also needed to be expended for Australia PR and the cost of skill assessment which varies with the authority required for the same. 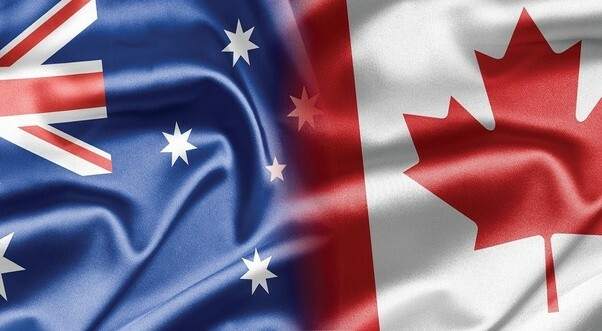 Independent economy:The economic prosperity in Australia is more than that in Canada. Its actually true that development of Australia is miraculous. Australia does not have much of its economic development coming from what’s happening in US, Japan and China. In fact, the capital flow to this country was the highest as compared to the countries of US and Canada. The capital flow to Canada was 57.8 million dollars whereas to Australia was 58.2 million dollars for the years 2005-2013. The economy of Canada on the contrast is quite dependent on the economy of US. Talking about the different sectors, Australia, gets its incomes from various sectors such as banking, exports and telecommunications. The country also has income generated from mining. That’s why, the country is not reliant on any other country for income unlike Canada where a major part of its GDP comes from exports to US. The exports of the country to the other countries were to the amount of 528 billion CAD in 2014. Amazingly Canada also has trade agreements with the US, under which NAFTA is a prominent one. Canada has a large part of its exports in minerals. Visa Services Canadian PR visa. permalink.